Cut up a quarter of a pound of fresh butter into a pint of West India molasses. Warm it just sufficiently to soften the butter, and make it mix easily. Stir it well into the molasses, and add a table-spoonful of powdered cinnamon. Beat three eggs very light, and stir them, gradually, into the mixture, in turn with barely enough of sifted flour (not more than a pint and a half) to make it about as thick as pound-cake batter. Add, at the last, a small or level tea-spoonful of pearlash, or a full one of soda, dissolved in a very little warm water. Butter some small tin cake-pans, or patty-pans, put in the mixture, and set them immediately into the oven, which must not be too hot, as all cakes made with molasses are peculiarly liable to scorch on the outside. Image: Raphaelle Peale. 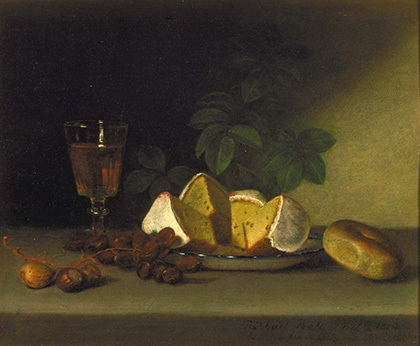 Still Life with Wine, Cake, and Nuts, 1819. Huntington Library, Art Collections, and Botanical Gardens, Gift of the Virginia Steele Scott Foundation.